This article was sponsored by Tumult. Thank you for supporting the partners who make SitePoint possible. Animation can roughly be defined as showing successive images or frames to give the illusion of smooth changes. Instead of producing every frame by hand, modern web animation tools like Tumult Hype let an animator create keyframes (generally start and stop points) and the computer dynamically fills in all the inbetween frames. How the computer decides to generate these frames can affect a viewer’s attention and emotional connection. This article explores a critical piece of generated animations, the Timing Function, and how to make best use of Tumult Hype’s advanced timing function editor for your animations. Before reading, the first step is to download Tumult Hype. The trial is fully functional for 14 days. Tumult Hype has two flavor modes: Standard and Professional. For making custom timing functions (and following along with this article! ), you’ll want to use Hype Professional. This looks better, and is the most common choice for animations. It is the default timing function in Tumult Hype and most other animation tools for good reason. Nature does not move mechanically like the linear timing function above. Timing functions like easing therefore serve a critical role in humanizing the elements you are animating. This helps present information cleanly and clearly. It directs focus. Good timing helps give meaning to animations. It turns lifeless shapes into reality. Some can help convey emotion which is critical to branding. Other timings can entertain and engage. The movement of “inanimate” objects is governed more by physics. “Animate” objects are governed by their own thoughts and emotions. Both styles can be modeled with timing functions. Editing the timing function of an animation in Tumult Hype is easy. Step zero is making the animation, so if you’re unfamiliar check out the tutorials and documentation. When no animations are selected, the default timing function is shown as the title of the timing function pop up button. Crafting and choosing timing functions is a skill, experience will make one better. Let your animation “rest” by going a few days without looking at it, and see if you still like it when you come back. Or get feedback from peers. Looped animations should generally use a Linear timing function. Ease-based timing functions would create a stop point or jump at the start of the loop cycle. Avoid significant Easing In (slow acceleration) with animations that were triggered by user actions as it will feel sluggish. Overshoot (Back) and Anticipation (Reverse Back) can be effects that can look glorious, but often this goes against the purpose of an animation of helping a viewer associate actions. Further, these can waste a user’s time since they tend to take longer. Use sparingly. It can be good to experiment with using the same animation durations and different timing functions for more visual intrigue or to express differing weight/inertia. That said, unless animating from natural models or characters, it is better to not go overboard with too many different timing functions. Don’t forget to also experiment with staggering animation start times or slightly changing duration instead. Just as visuals often have a spec controlling line weights and color palettes, it is good to come up with a design language for animations including durations and timing functions used, along with rationale for what circumstances to choose which timing function. Observe nature and understand the mathematics of gravity/physics as this can help inform how to compose animations. For example, to make a bouncing object, the Y value should use the Bounce timing function. The X value should have a linear timing function because there are no forces acting on that axis. Even if well understood, sometimes it is just easier to use a physics engine. 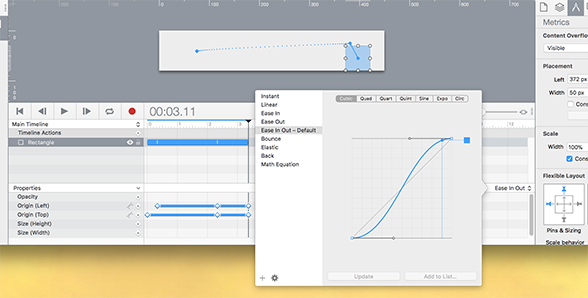 Manipulating timing functions is an advanced step in creating meaningful animations. They can help both model physics, emotion, or simply reduce keyframe construction. 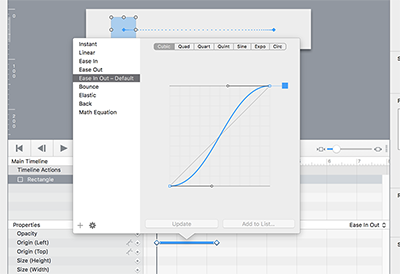 Tumult Hype’s custom timing function editor gives power and flexibility to help make your best animations. If you’d like to give Hype a go, right now as a SitePoint user you can get Hype Standard for 50% off at $24.99 USD. Or if you’re after the version with all the bells and whistles, we’re also offering a 25% discount for Hype Professional at $74.99 USD. Jonathan is the founder of Tumult and lead developer of Hype. Heâ€™s a multi-talented Objective-C hacker, web developer and designer. Jonathan previously was an engineering manager at Apple responsible for teams working on Mail.app, macOS updates and automation tools. He started writing macOS shareware from his dorm room at Purdue.